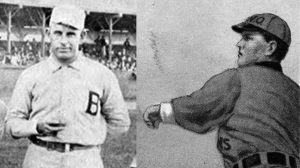 Ted Breitenstein and Jim Jay Hughes threw no-hitters on the same day, 118 years ago today. Ted Breitenstein, who pitched for the Cincinnati Reds, no-hit the Pittsburgh Pirates at Cincinnati’s League Park on Friday, April 22, 1898. That same day, Jim Jay Hughes, of the National League Baltimore Orioles, no-hit the Boston Beaneaters.